SOD is an effective material to fight against free radicals in the body. Why do people become sick, aged and dead? Biologists and medical researchers found that the source is from a material with strong oxidation – free radicals which always make troubles to the body. Free radicals produced from a variety of toxins in the world and acidic toxins produced by metabolism. When the body can not exclude the toxins promptly from the body, the formation of free radicals may then generate. Free radicals can damage cell membranes and even cut off the nucleus of the chromosome DNA chain, thus speeding up the ageing of cells and reducing immune function so that cells of the gene (genetic code) engender mutation and induce tumors. At present, medical professions have shown that semi-quinone free radicals can cause lung cancer; lipid free radicals lead to breast cancer; superoxide free radicals are highly destructive to all tissues and organs therefore free radicals are known as the killer of cells. Vitamin C, vitamin E, vitamin A, catalase, superoxide dismutase (SOD) are direct materials to fight against free radicals. Zinc, copper, manganese and other trace elements are in the materials, used to eliminate lipid or superoxide free radicals in the body. 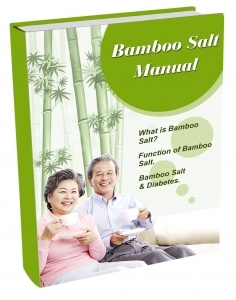 Bamboo salt contains a great deal of antioxidant components, such as zinc, copper, selenium, germanium, arsenic, etc which can inhibit the release of “telomerase” in tumor cells thus it induces the cancer cells to a “shut down” state and even makes it dormant. This is for enhancing the ability of the body to “combat” and “kill”the cancerous cells or lead the cancer cell to death. This is the role of SOD to the body. Why is saliva called “Yu Ye” (juice of jade)? Is there any criterion to eat salt? What set the standards down?